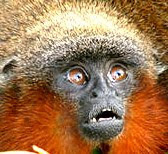 A scientific expedition to the Colombian Amazon has revealed a new species of titi monkey. The cat-size creature is critically endangered because of rapid habitat loss and its small population. Research from 30 years ago hinted that a previously unknown primate species might be living in Colombia's Caquetá region, near the Ecuadorian and Peruvian border, but violence and insurgent fighting kept the area off limits for decades. It was only recently that scientists of the National University of Colombia proved the rumors true when they discovered the new species.